Almost every Second World War at Sea player has been fascinated by these. They are huge, they are powerful, they are monsters ... they are Yamato and Musashi! Still, very few really know about them, especially the reason that surrounded their creation. The common explanation is that they were the product of an outdated almost fanatical faith in the big guns, an obsolete waste of resources that doomed Japan to defeat. Was this really the case? The genesis of the Yamato class is deeply linked with the realization that, in the eventuality of a war against the United States, Japan would have to fight from a position of inferiority. There was no way to compensate for the lack of industrial capacity after the war started. Despite what is usually thought today, Japanese leadership at all levels realized it. The Imperial Navy set about to compensate for this imbalance in two ways: the first was to increase its long-range striking power with long-range torpedoes and air power, and the second was the development of the super-battleship concept. Yamato running trials, 30 October 1941. The origin of the Yamato class design can be directly traced to Yuzuru Hiraga, the chief naval architect of the Navy in the 1930s and the man behind every Japanese ship design from the HIJMS Fuso onward. While often they have been described as the ultimate offensive weapons, capable of destroying enemy fleets, the idea behind the design was defensive. The aim was not to destroy the enemy, but to build a ship capable of engaging superior enemy numbers and tying down resources in excess of those needed to build her. Everyone in the Imperial Navy realized how dire Japan’s predicament would be in a war against the United States. They knew that they were facing an industrial power exponentially bigger than theirs. So the new ship would not have been a match for enemy battleships, but for entire battleship divisions. It was not simply a matter of matching quality versus quantity, it was to devise a way to neutralize enemy superior industrial capability. Even if today it seems a folly, at the time it was a logical concept. In “practical terms,” that meant she would have had to have the most powerful guns, the most effective armor, terrifying anti-aircraft protection and a stable gun platform, and be fast and maneuverable. Of course all those requirements conflicted with one another. Even more important, too much of several good things is not a good thing in itself, especially if a real-world ship is to be built, so the final result was a compromise. 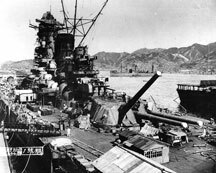 Yamato in the late stages of construction alongside the large fitting out pontoon at the Kure Naval Base, Japan, 20 September 1941. Main armament was finalized as nine 18-inch guns (460mm) in three triple turrets. Secondary armament was to rest on a dozen 6-inch guns in triple turrets. The 18-inch gun was certainly the most powerful naval piece when designed in the late 1930s and its range was unsurpassed in World War Two. Anti-aircraft protection was adequate against any threat available at the moment of design. We have to remember that in 1935, when the class was conceived, the main threat was represented by slow moving, underperforming and frail biplane level and torpedo bombers. The ship was also equipped with the best fire control systems Japan had developed both for surface and anti-aircraft gunnery. While not sophisticated as the new American computers just being designed, they were more advanced that anything used by the other navies, with the exception of the Hazemeyer system fitted on Dutch ships. And, what was important at the time, perfectly adequate to track and engage the available targets. The need to accommodate speed, stability, armor and maneuverability shaped the ship design. Affording massive protection to all the ship was impossible if said ship's displacement had to be kept in a realistic size. So Yuzuru Hiraga moved to a “Citadel” concept. The center of the ship would have been enclosed in an armored citadel impervious to everything the Americans could throw at her and, more important, able to guarantee flotation and power even if everything forward and aft of it was flooded. Protection outside the armored citadel would have been ensured by a massive number of watertight compartments. Yamato maneuvers while under heavy air attack by Task Force 58 planes in the Inland Sea, 19 March 1945. The immediate implication of this choice was the need to place machinery in the center of the ship. The designers dispensed with usual practice to have engines and boilers in rooms located sequentially. Yamato and her sisters would have had machinery space one beside the other amidships. Three boilers served each of the four turbines. This explained the exceptional beam of the class. Large beam in turn helped achieve another one of the design’s goals: a stable firing platform. Inclination was minimal even when hard rudder was applied. Speed reached 28 knots during sea trials. While for today's standards it doesn’t seem like a lot of speed, we are talking about a ship of 70,000 tons of combat displacement (actually 69,998 ... like when they price games at $59.99) designed in 1937. It was also incredibly maneuverable. 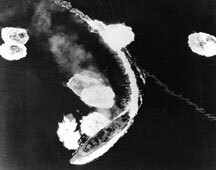 Reports from Allied pilots attacking Yamato and Musashi praised their turning ability. Unlike American battleships of the same time, they were given a hangar and extensive aircraft facilities to handle reconnaissance floatplanes. There was even an elevator to move them from the under deck hangar to the “flying” deck. The maximum complement was seven, but usually only between three and five were carried. Finally, and this is my personal opinion, they were handsome ships. Construction of those ships was surrounded by secrecy. There are several interesting anecdotes surrounding the two giants. During construction special cloth and paper screens were erected around the shipyard to prevent observation, trains moving in Kure had the windows on the side facing the harbor darkened. Even in 1943, the Imperial Navy was still very sensitive about their secrecy. When the German naval attaché in Tokyo, Konteradmiral (rear admiral) Paul Wenneker asked permission to visit one, permission was granted only after long debates about security. From the surviving account it seems the German admiral was kept above deck and on the bridge and away from the guns. He was shown the aircraft elevator and some other places, and disembarked after an hourlong tour (I, a civilian, have been onboard HMS Albion longer). The fact that the ship had 18-inch guns instead of 16-inch was a closely guarded secret; Wenneker was told the guns were 40cm. All those efforts paid off because American intelligence was largely ignorant of the detail of the ships. The tonnage estimates were around 50,000 tons and the armament was believed to be “conventional” with 16-inch guns. So at the start of the war Japan had two almost-completed secret battleships (two other more were on the slips, but as pointed out in a previous Daily Content article they were not destined to be completed as battleships), but there were doubts. While the Imperial Navy as a whole was supporting them several of the most ardent airpower advocates had condemned them. Also between their design and their completion five years passed, five years in which new technologies had emerged. Would they be able to survive the test of the real war? Wait until Part Two! Don’t wait to put Midway Deluxe Edition on your game table! Join the Gold Club and find out how to get it before anyone else!